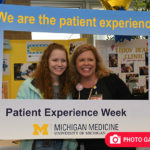 Throughout Michigan Medicine, there are remarkable stories of discoveries and achievements in basic science, clinical, and translational research. The Frontier Seminar Series, hosted by Bishr Omary, M.D., Ph.D., chief scientific officer and executive vice dean for research, provides a platform for storytelling and sharing important work. The next seminar in the series will be held Tuesday, Sept. 25, at noon at Kahn Auditorium in the Biomedical Science Research Building. The event will feature Parag Patil, M.D., Ph.D. and Jim Weiland, Ph.D., presenting the latest in neuroengineering research.